The finals game was 2000 points, Total Warfare. Ravenwood, left to right: Bear Pack behind Treant, Bearkin, Bearkin, Bearkin, Bear Pack behind Ravenwood Swordsmen. Brook brought the beef! A frightening army for Wuxing to face! Wuxing, left to right: Fu Dogs, (gap), Terracotta Spearmen, Terracotta Swordsmen, Healer Mages behind Jade Nobles, Salvaged behind Jade Nobles, Salvaged behind Spearmen. After Brook won repeated victories with archers, I was expecting to see one here. Probably wouldn't have taken a Healer Mage had I known what his army would be (That's a hidden strength of Ravenwood--multiple viable builds that can keep the opponent in the dark regarding which to expect. ), though there's still not a bad unit here. Hit points on 1/3 and 1/4 Wuxing units are pretty valuable. In the opening moves, The Treant races forward on one flank, while the Bear Pack takes the other flank. I position the Spearmen on the road, with the Fu Dogs ready to pinch, while Salvaged move to cover the other flank. Note: The Imperial cavalry on the left near the Bear Pack is a proxy card. Jade Tokens represent Aura Cleanses from the Healer Mage. Brook realizes the Treant won't win vs. Spearmen + a Fu Dog pinch, so he's forced to slide the tree into the low brush to make way for the Bear Pack and widen his line. The low brush means it'll be a few turns before the Treant gets into the fight, meaning until then my line will outweigh his significantly. I'm happy with this. Healer mages are putting Aura Cleanse on the Terracotta line units. I figure the Jade Nobles got this, so want to make sure their weaker terracotta brethren stay in the fight and nobody gets pinched..
As terracotta units take up flank-protecting positions, the Jade Nobles engage their Bearkin oponents--the two fights I want are happening first! However, in the first bad portent, I had drawn exactly zero red cards, so on that critical charge turn Brook was able to play both blue and red cards, while I had blue cards only add in some mediocre dice and his Bearkin are effectively unscathed. The Treant engages my Fu Dogs. My initial hope is that the Fu Dogs can survive 2 turns of combat, which will delay the Treant getting into the fight for two more turns, but a really good charge turn ends that hope. At least the Fu Dogs are positioned so that nothing is in the Treant's front arc. 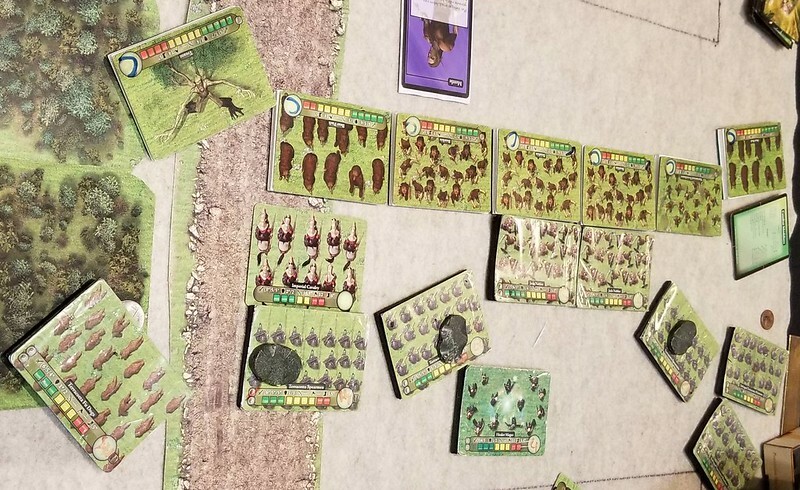 In a curse that looked like a gift, Terracotta Spearmen do well more damage than expected vs. the Bear Pack on the first turn, I roll 4 damage and play Cunning for 1 more. A rout would've been nice, but the Bear Pack predictably sicks around. I throw a precious Might card thinking I just might be able to take down the bears and pinch someone, but my Spearmen whiff the next attack and it's just a wasted red card. Terracotta Swordsmen are losing to Bearkin. Not unexpected, but kind of sad that they've scored zero damage. Bearkin whallop the Jade Nobles. Brook made good use of Spirit Guidance, and my dice went cold. Bearkin did have to make a rout check in the yellow and had he blown it I'd have had a pinch before this disaster, but they passed. One Jade Nobles had crumbled. Insult to injury is that the Healer Mage didn't really help with this--Aura Cleanses were on my Terracotta units and I elected to heal those 2 rather than the Jade Nobles 1. One bit of luck was that Ravenwood Swordsmen routed in the yellow on his turn, so were engaged and popped. My Terracotta Spearmen would pinch away the Bear Pack as it chewed on the Salvaged stack, but it wouldn't be enough. Bear Pack chews on Salvaged. Brook pitched a card to play Aspect of Wolf for +1 MC to get them into combat 2 turns sooner, which I was pretty happy with at the time as it meant any blown rout check would really hurt. Didn't end up mattering. Anyway, my whole plan was to bust through with Jade Nobles and while my Terracotta units overall were doing OK, losing those fights my plan relied on winning made a victory impossible here. Wuxing raised the white flag. Good game, Brook, and well played! Good game, everyone! 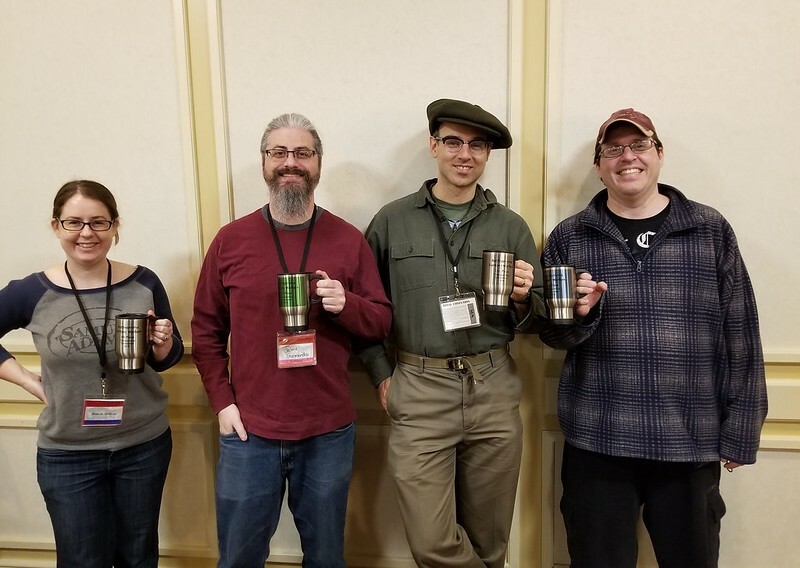 Thanks for running the event, Marcus--and for these pretty mugs! Always a pleasure playing against you Kevin. Yeah, I knew that I wasn't going to get anywhere going archery heavy against Wuxing, so I decided to bring the beef. I even said to myself before the match, "if he plays nobles at least the bearskin have a chance to do some damage" and as an added bonus, Spirit Guidance could be used!!!!! I didn't expect my bearskin to out right win the matchup, with their courage and damaging on twos I thought they would be respectable. My dice were good on the "too damage" roll. Kevin's dice weren't that good over all. I had a fun time playing and was glad to hear that Ravenwood never won a tourney and that the bad streak had ended. Ravenwood is my favorite faction(as most of you know I like the elf factions, except for Dark Elves.) and that made the win extra special. Those Bearkin units manned up for sure! I remember Kevin remarking early in the game that he felt OK not using Aura Cleanse on the Jade Nobles and I don't blame him. Boy was he upset about it at the end of the game. What Kevin did here is a textbook example of delaying the bad engagements while accelerating the good ones. It just didn't work out as the Bearkin caught fire and Brook took the match ups he was given. Even if the Jade Nobles held, Ravenwood would have eventually owned the flanks and it would have been a dog fight at that point. Or in this case, a bear fight. Well played by both of you and congratulations to Brook! Even if the Jade Nobles held, Ravenwood would have eventually owned the flanks and it would have been a dog fight at that point. Minor correction here. I was confident that I'd win the right flank. 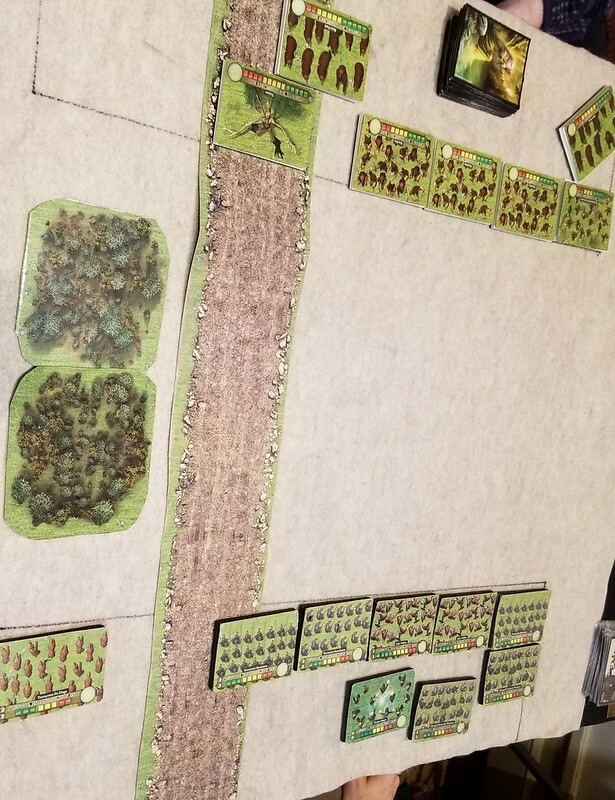 My Terracotta Spearmen (236) who were getting their first 2 damage healed were heavily favored to wipe out the Ravenwood Swordsmen (207) and pinch the Bear Pack before the Bear Pack gets through the Salvaged chump stack. 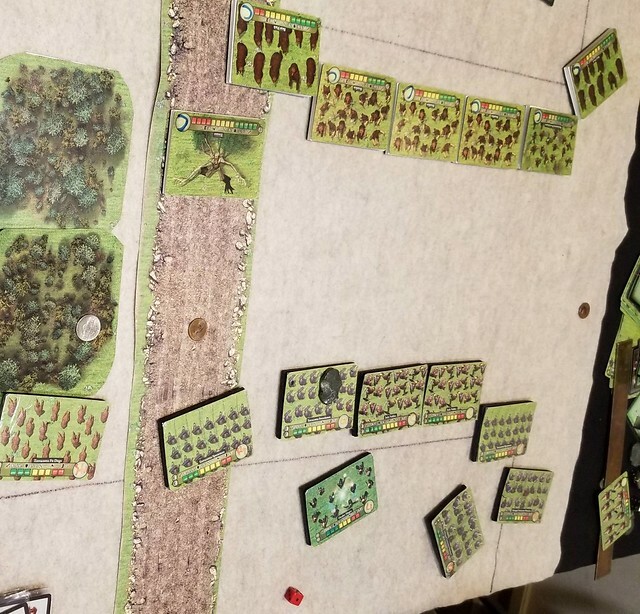 (Indeed, in the game the Ravenwood unit routed while the Terracotta unit was still in the green.) The only question is what happens in the left-center (Bear Pack vs. Terracotta Spearmen and Bearkin vs. Terracotta Swordsmen. Probably the median outcome is that the Bear Pack prevails (the Treant is coming in to pinch, if nothing else), as do the Terracotta Swordsmen (who may receive aid from Jade Nobles, as well as two boxes healed). If that happens, it's a pristine Treant and a wounded (and uncontrolled) Bear Pack vs. 5 banged-up Wuxing Units (Swordsmen, 2 Jade Nobles, Spearmen, Salvaged) and a Healer Mage Repair Technician gradually fixing them up. Bloody, but I like those odds. But there definitely was a chance, probably 25% - 40%, that something would go horribly wrong somewhere on the line, and we saw that here. Ouch! Well yeah, I stand corrected because I totally left out the Repair Technicians when making that determination.